Measurements: 8.4 cm H x 5.6 cm DiameterHeight taken at tallest broken edge. Marks/Label: Partial lettering around a partial design on front "TERCO ARMOUTH, N.S.". 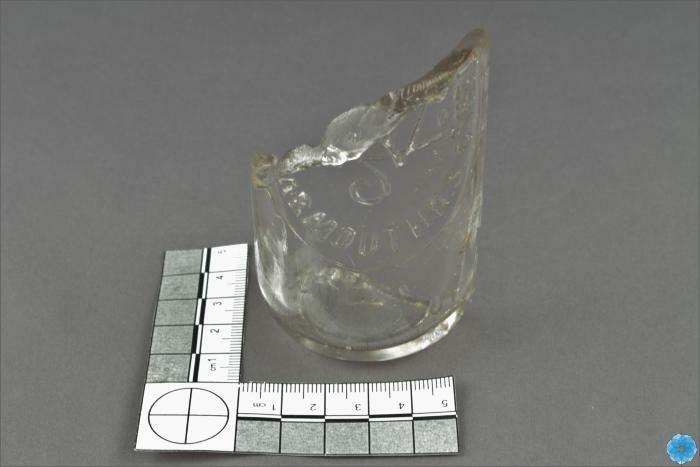 Description: Small, broken, round, clear glass bottle with partial sides and partial lettering. Base has digit 1 and is approximately half intact. Thick glass throughout. History of Use: Extract bottle used by druggists like C.C. Richards and L.C. of Yarmouth circa 1880.